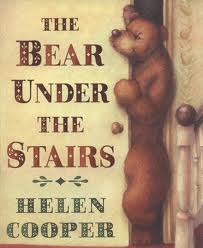 The text of The Bear Under the Stairs tells a straightforward story of a boy called William who is frightened of a big and hungry bear he believes he has seen behind the door under the stairs. He's so scared of the prospect of the bear getting peckish and deciding to eat boys for tea, that he starts feeding it preventively, from leftovers and other bits and bobs, until his mother notices the stench coming from under the stairs and decides it's time for a clean. After desperately trying to stop her, he finally blurts out his story about the bear under the stairs, and his mother suggests they both face up to it and fight it. They approach the door, mop and broom held like lances ready for battle. When they finally open it, they find an old furry rug instead of a bear, and lots of stinky food everywhere. They both clean up and then go and buy William his own grizzly teddy bear to keep him company in bed. And he is never ever scared of bears again. To this straightforward story of a boy facing up to his fear, the illustrations add delightfully interesting complexity by suggesting different planes of reality, with William's imagination, the bear's imagination, and the reader's own imagination counting as much as any reality that might be. The bear appears in most of the illustrations, either as an onlooker, hiding somewhere, or as an active character itself. We are shown the bear arriving at the house at the beginning of the story and packing up his luggage at the end, looking rather miffed. Might there be another story here, about a bear who is terrified of being discovered by a little boy and his mother in his newly found home and of having to move yet again? The Bear Under the Stairs raises philosophical issues regarding the nature of fear, on the one hand, and about the nature of reality and its relationship with imagination, on the other. But it also provides the perfect starting point for fun discussions about whether we can know that we ourselves are "real" and about the reliability of our senses. Three thematic blocks of questions to prompt debate among children follow, with a very brief and general, non-specialised and name-free background introduction to each of them for teachers / parents / grandparents / anyone out there interested. In the story William is scared of something he thinks he's seen. His fear both moves him to action (he feeds the bear he's afraid of) and paralyses him (he doesn't tell anyone about his fear). This raises interesting questions regarding the nature of fear, the causes of fear, the relationship between fear and imagination, the relationship or lack of relationship between knowledge and fear, and our own attitude in the face of fear. The first set of questions aims to draw on the children's own experience and reflection about their own fear and William's fear to come up with potential definitions of fear and analyse its causes and consequences. In the story, William is frightened. Why is he frightened? What is he frightened of, exactly? Does he really have a reason to be frightened? What things frighten you? Why? What do you think causes fear? What removes it? Are you more frightened of real things or of ideas? Is fear always a bad thing or can it be useful? Do you think William dealt with his fear appropriately? What would you have done in William's situation, if you thought there might be a bear under the stairs? Have you ever been "secretely" scared of something and not told anyone? What of? Why didn't you tell anyone? After William finds out what he thought was a bear was in fact an old rug, his fear seems to go away. Does knowledge always remove fear? Is it possible to "know" that there isn't a bear under the stairs or a monster under your bed and still "be frightened" of it? How is that possible? The Bear Under the Stairs touches on issues regarding reality and imagination and, through the illustrations, suggests or plays with the idea that the bear might be more than a figment of William's imagination. It poses several possible scenarios. Perhaps the bear is entirely a figment of William's imagination. Perhaps William's reality and the bear's reality are parallel, co-existing realities. Perhaps William and his mother are figments of the bear's imagination? The philosophical questions here regard the difference between reality and imagination or reality and dream, leading to the all time classic "how do we know we are not dreaming?". In turn, this raises general questions about reality, how we know what's real, whether we ourselves are "real", or whether even we ourselves could be a figment of someone else's imagination. What is real and what is imaginary in The Bear Under the Stairs? Is the bear real? How do you know? Could everything we see in the story be real? Both the bear's reality and William's reality? Do you think the bear "really" draws William? Or do you think the drawing of William by the bear is part of a dream William's having? Why? What's the difference between reality and imagination? How can we tell when something is real rather than imaginary? What's the difference between reality and dreaming? Have you ever been unsure as to whether something really happened or whether you dreamed it? How did you find out which was the case? How do you know you are not dreaming now? Are you real? How do you know? Could you be the figment of someone else's imagination? A scared bear's imagination, for example? William "sees" the bear through the crack of the open door under the stairs. He takes this visual perception as information about the real world, reacts to it (is frightened) and acts upon it (feeds it in order to save his own flesh from the bear's hunger). He takes his visual perception as knowledge. Later, with his mother, he "sees" that what he thought was a bear is in fact an old furry rug and readjusts his information about the real world based on this new visual perception of the rug. This raises interesting philosophical questions about the reliability of our senses and our perceptual knowledge of the world. William "sees" the bear through the crack of the open door. Later he "sees" the rug. How does he know that it's a rug and his senses are not deceiving him? Why is the second time William "sees" more reliable than the first? How do you know the table in front of you is real? If it is real because you can see it, is it still real when you close your eyes? What makes it real? Do our eyes provide us with trustworthy information about the real world? Is reality as we see it? When we stick a straw into a glass of water, our eyes tell us it's bent, but is it? How do we know that our eyes don't show us things differently from the way they really are all the time? What is "the way things really are"? Dogs don't see colours the same way we do. Which reality is more "real", dogs' reality or ours? The Bear Under the Stairs poses a range of philosophical issues of varying depth and abstraction. Younger children may find it easier to engage in a debate on fear than on the reliability of the senses, but not necessarily. Remember to ask the children first what they have found interesting about the story. You'll be surprised how often they come up with many of the philosophical issues themselves. Remember the idea here is not to plod through all the questions in order, but to use them as a guide for a lively and kid-driven discussion. Let them take the lead! Enjoy! And leave a comment telling me how it went if you used any of the above material! (c) of text, Ellen Duthie. You may copy this or reproduce it, but please be nice and credit the author and the site.